You’ll be PLAYING GUITAR in less than ONE HOUR from now!! finally be on your way with this incredible program! - 305 video segments, 40+ hours of HD Video Instruction on different aspects of playing the guitar such as for example: acoustics, reading music, guitar geography (learning the fretboard, ear training for melody and harmony, guitar techniques such as strumming, figerpicking and introduction to blues guitar, country fingerstyle, solo and lead guitar. - ‘step-by-step, note-by-note, and chord-by-chord ‘ Teaching Method. 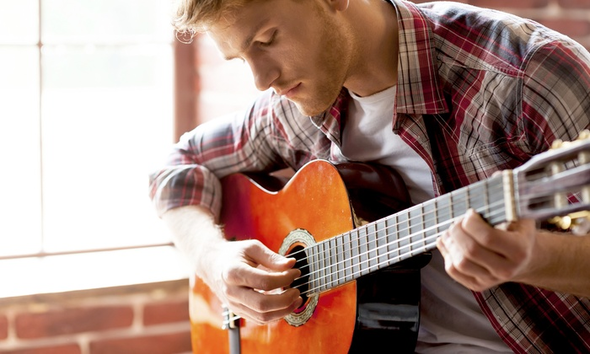 How to grab it, own it, and rock it on the acoustic guitar. - conducted by Head Instructor Neil Hogan who played with many, world-class celebrities and Grammy Award Winners (Laurence Juber), multiple Grammy Nominees (John Redbourn, Neil DeGrassi, Keola Beamer) and collaborated with a Platinum Album Artist – Al Stewart.